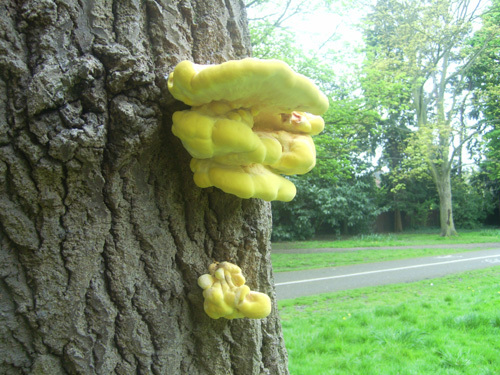 This nationally common bracket fungus is often seen on both living and dead trees throughout our area, it is distinctive due to its bright colour; orange-yellow with brighter borders to the cap, this fades with age becoming dull and dirty white. When young the flesh is spongy, soft and moist and the pores exude dewy droplets, with age the consistency becomes more rigid and the flesh eventually dries to a brittle mass. When developing in dark situations the fruiting bodies produce Staghorn-like processes. Develops on a range of broad-leaved timber, possibly with a preference for Oak, spores enter through wounds in healthy trees and the mycelia produce a red/brown cuboidal heartwood rot. 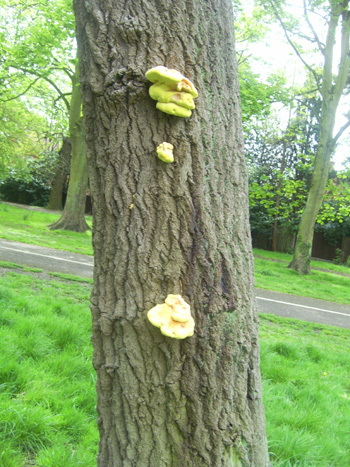 Found on standing or fallen timber in all stages of decay, fruiting bodies generally from late April to October. Fruiting bodies and host damage harbour a wide range of Coleoptera.